This report aims to identify best practices in Human Rights Impact Assessments (hereinafter, HRIA) and incorporate these findings into the development of an HRIA tool for communities affected by investment projects. Communities could use this HRIA tool before, during and upon completion of an investment project. In addition, the community-led HRIA approach can help businesses improve their own human rights due diligence procedures. 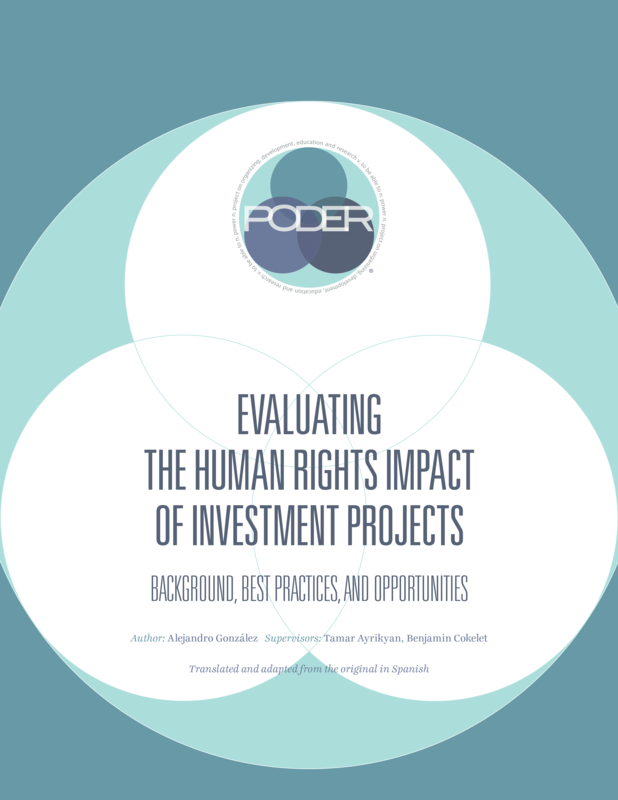 By reviewing the normative foundations of human rights impact assessments, current best practices and opportunities for further development, this report aims to contribute to the efforts of communities, companies, governments and other stakeholders to ensure respect for human rights in the context of investment projects. Communities affected by corporate activities have developed a range of approaches to address human rights violations caused by investment projects. Within legal strategies, cases have been brought before national and international courts relying on agrarian law, injunctions for human rights violations, or indigenous rights and the right to free, prior and informed consent (FPIC). In parallel, political strategies include lobbying governments (local, national and foreign), or influencing public opinion through media advocacy. Using grassroots mobilization, marches, protests, roadblocks, strikes, and occupying buildings, communities seek to physically halt projects while also attracting public attention to the issues. Although these strategies have produced some results, they have been insufficient in preventing the harm caused to affected populations. Cases of severe environmental damage, threats to community leaders, activists disappeared or killed, and communities displaced, continue to occur against a backdrop of a lack of political will or inability of governments to protect vulnerable populations from these threats. To a large extent, the state is captured by a corporate elite, resulting in an unfavorable context for human rights whereby economic interests prevail over social and human rights objectives in the formation and application of public policy and regulatory frameworks. The tight relationship between government and business leads to cases where, for example, mining companies operate with very few regulatory checks, with the authorization and support of government, and with little to no concern for the social, environmental and human rights impacts of their activities. In addition, these strategies are applied reactively, that is, once the investment project has already begun or is in very advanced stages. It is much more difficult to suspend or regulate an investment project at this late point because of the amount of resources already invested. In addition, a reactive defense strategy may not see fruits in time to prevent damage to human rights. The Project on Organizing, Development, Education, and Research (hereinafter PODER®) proposes an HRIA tool that would complement existing community-led strategies of prevention, negotiation and defense when confronted with the entry of an investment project. PODER has identified three key areas that a business- conscious, community-led HRIA tool would integrate: First, how business enterprises operate, with a view to understanding the incentives for investing in a specific project through a comprehension of the concept of risk, how risk is measured and how it impacts investment decisions. Second, it is essential that communities be equipped to evaluate and determine, independently, what the impact of an investment project is likely to be on their human rights. The human rights legal framework stipulates a series of obligations for states and businesses; it is critical that communities know what their human rights are and how to make the most use of existing protection mechanisms. Finally, it is crucial that communities be organized. Experience has demonstrated that communities that are articulate and cohesive are much better equipped to protect themselves and demand that their rights be respected. PODER proposes a tool that would help communities analyze and understand company logic as well as human rights impact, while also contributing to community organizing.